The rate at which you build up pension benefits on a DB pension scheme. Generally expressed as a fraction, the most common pension accrual rate in the UK is 1/60th of final pensionable salary for each year of pensionable service. A new government policy which began to be implemented in October 2012, which requires all full-time workers to be offered the opportunity by employers to enrol in a work place pension. Auto-enrolment operates an the ‘opt-out’ policy, meaning that workers will have to annually opt out of pensions contributions. Defined Benefit pension plan: a plan in which employers bear the investment risk and the employee receives a fixed monthly amount after retirement based on salary history and years of service. A form of DB pension plan in which the pension paid is calculated by the number of years worked, multiplied by the member’s salary at the point of retirement, multiplied by the accrual rate. Seen as a generous form of pension plan, many of these schemes are closing under the pressures of an ageing population. The Financial Reporting Council, an independent regulatory body and watchdog that promotes corporate governance. 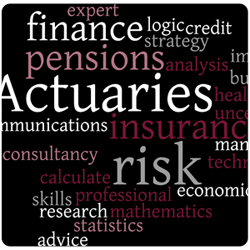 The FRC is responsible for issuing and maintaining Technical Actuarial Standards (TASs). A pool of money set aside for a specific purpose, e.g. a pension fund. See: hedgefund. A geographic information system or geographical information system is a system designed to capture, store, manipulate, analyse, manage and present all types of spatial or geographical data. A debt or obligation arising from past transactions that is settled over time through the transfer of assets or services. As average life expectancy increases, it will drive up the cost of the pensions people recieve: this is a key reason for the closure of many final salary pension schemes as well as the rising of the state pension age. Loss adjusting is the investigation and resolving of complex claims, making recommendations for a suitable settlement. A collection of funds from individual investors that are pooled together in order to obtain better prices than those available to individuals. Investors combine assets to get the best rates. The National Employment Savings Trust, a state-sponsored pension scheme provider created as part of government pension auto-enrolment reforms. The proposed amendments to Solvency II, which aims to smooth the transition to the new regulatory system and clarify the role of the new European Insurance and Occupational Pensions Authority (EIOPA). Also known as ‘Pension Loans’, these are schemes which enable people to access their pension funds before 55, often resulting in large tax charges to the individual. If people are misled about the costs and tax penalties this will incur, the scheme is fraudulent. Payment Protection Insurance. This insures that repayments of loans are met in the event that the borrower becomes unable to earn due to health reasons, job loss or death. The amount charged for insurance coverage – representing the calculated risk that an insurance company takes on in a given policy. In the financial services industry, product is used to refer to any goods or services that it sells, from financial planning to stocks and bonds. Reinsurance companies insure other companies in the insurance industry, allowing them to spread out the risk involved in taking on particular policies. An attempt to create a unified European framework for the regulation of insurance companies. Find out in more depth about Solvency II. The value, in today’s money, of payments that will be made in the future. An arrangement whereby one party (the trustee) has the right to hold assets for the benefit of the third party (the beneficiary), who will receive assets after a given time. (For example, when they come of age, or retire). The process of assessing a risk and deciding whether to accept it and at what premium. A pooled investment fund usually run by insurance companies. An insurance contract that participates in the profits of a life insurance company. This is often used to pursue a more adventurous investment policy and achieve higher returns than general savings accounts.